One of my roles in the school is to help support teachers create a safe and welcoming classroom for all students. I often work with the autism resource teacher to create visual aids, social stories and visual schedules (we've been using a lot of LessonPix, which makes visuals quick and easy). We also help teachers learn how to interpret and help unexpected classroom responses. Is that student yelling because he is just defiant? More likely, he doesn't understand the assignment and feels overwhelmed at the task. So I've been searching for some great online resources to share with teachers, especially after some professional development for using the Zones of Regulation. 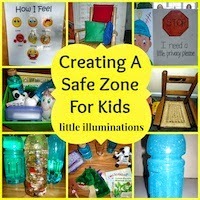 Tonight I found a great blog with suggestions for a Safe Zone in the classroom. Childhood is a magical time. It can also be very frustrating! Learning to navigate our own feelings and emotions and dealing with others' as well can be a slippery slope. Much of the time that children are acting out, they are actually struggling with managing their emotions. Read the whole post, including app suggestions, by visiting Smart Apps For Special Needs!